Disclaimer: I do not wish to sound like an agony aunt in this post. Any similarity is purely coincidental. Also, I’m making my foray into male fashion posts by breaking a few stereotypes. Thank you Aditya for the post idea. Most of the guys I know dismiss fashion as something purely for girls, a fickle interest that no “straight” male should care about; alternatively, they think fashion is reserved for formal wear. More often than not, a personal sense of style is equated to narcissism, a trait apparently reserved for women. But I think they’re mistaken, for more reasons than one. Being fashionable is neither something to be ashamed of, nor is it a worthless pastime. It is also not difficult, which is another reason guys write it off. Today, first impressions can make or break a path. A dapper guy makes a better first impression on possible employers, and people on the street, in comparison to a not-so-well-dressed one. It instantly elevates your personality, and catches attention in the right way. You don’t need to be on-trend, or dressed in a suit to make a good impression either. Also, dressing well gives you a boost of confidence, which goes a long way in all walks of life. Think about it, Harvey Specter’s appeal can be partly credited to his well-cut suits & scarves, and his off-duty style of v-neck t-shirts and denim. Whatever he’s doing, his sense of style adds to his personality, and makes him memorable to both prospective clients, and us viewers (not like he needs another reason!). This is cited by guys, and girls alike as a reason to not care about how they dress. And it couldn’t be farther from the truth. The endless trends spawning from fashion weeks can be a chore for even the most experienced fashionista. However, classic styling options can be played around with easily. All you have to do is look for the right inspiration, and alter it in a way that you like. It’s as simple as a striped round neck t-shirt, a plain shirt, and a pair of chinos. Or even a long sleeve shirt, jeans, and loafers, with the sleeves rolled up. And bam, you look great for any occasion. Fashion is definitely not complicated; you do not require expert layering to look good, neither do you need to know all the fancy words you can’t pronounce. Fashion is easy; you just need an open mind. Blaine Anderson of Glee has a distinct sense of style (see also: Kurt Hummel). Photo via Pinterest. Male TV characters have something unique about the way they dress. Whether it’s a button down shirt or a suit, each character wears it in a different way, which speaks about their personality– fun prints and bow ties indicate happiness and joy, a well-made suit instantly reads suave and charming. It is a unique form of identification that can be changed up as many times as one wants, which is why I call it a form of expression. Dressing well on a bad day (everyone has a few) can boost your mood too (#truestory). It can even change to suit your mood, your favourite TV show, and even college dress codes, if you develop a strong aesthetic. You don’t need to spend on Armani Jeans or J. Crew to look like a million bucks. Buying clothes from your favourite stores works just as well, if not better. All you need to ensure is their fit– it shouldn’t be too tight (especially not t-shirts), and the sleeves shouldn’t go over your wrists. I would personally recommend sticking to long sleeve shirts (button-downs), which can be rolled up. Short sleeved shirts can make you look a little old, depending on the situation. Fashion isn’t time consuming either. Once you start buying clothes that fit (trying them on is KEY), you’ll know what brands work and what doesn’t. Further, you will eventually evolve a uniform of sorts that you like to wear & you receive compliments on; you’ll have a base that you can build up on for experimentation. Maybe you like chinos and plaid shirts. That’s great! Try wearing a t-shirt inside, and wearing the shirt like a jacket (unbuttoned). And you have a way to multitask clothing => economical fashion. 5. Fashion can be fun! There are virtually no rules for fashion. You can do anything! 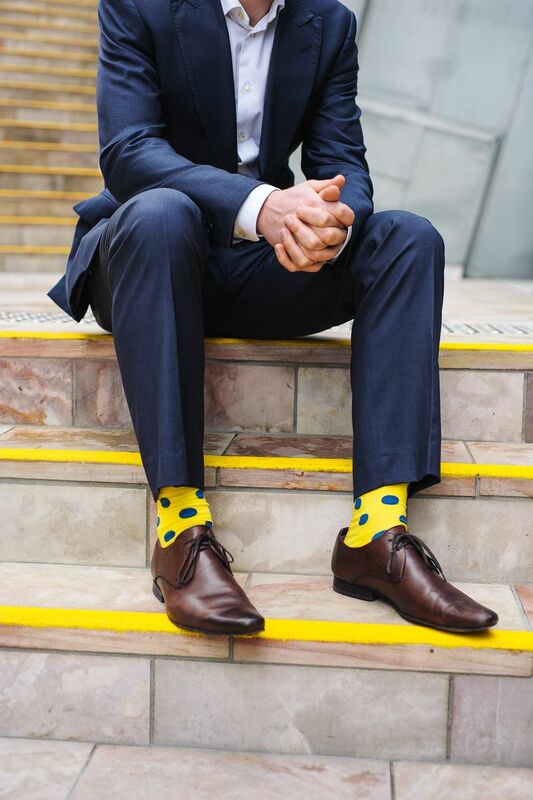 Wear striped/mismatched socks with suits. A dress shirt and shorts [fun socks are the best way to perk up any piece of clothing (but not long socks with shorts and/or sandals. just, no)]. You can wear shorts (I can practically hear the sighs of relief), your favourite sneakers, maybe even a seahorse-print shirt. Anything! Fashion is fun, and enjoyable, and a great way to step out of your comfort zone. Just don’t wear skinny jeans. Leave that to the girls. Added bonus, your girlfriend will love you for dressing well while retaining your individuality. You needn’t know any fashion trends, but a good, and unique sense of personal style goes a long way– looking good never hurts! If you guys made it to the end of this post, thank you for reading! I hope you liked my foray into men’s fashion. And if you want to read more posts for guys (maybe outfit inspiration? Tips on layering? Instagram accounts to follow? ), let me know in the comments & follow me on Facebook to keep up!